Join PBIS Rewards at the 2017 GAPBS Conference, November 28-29. 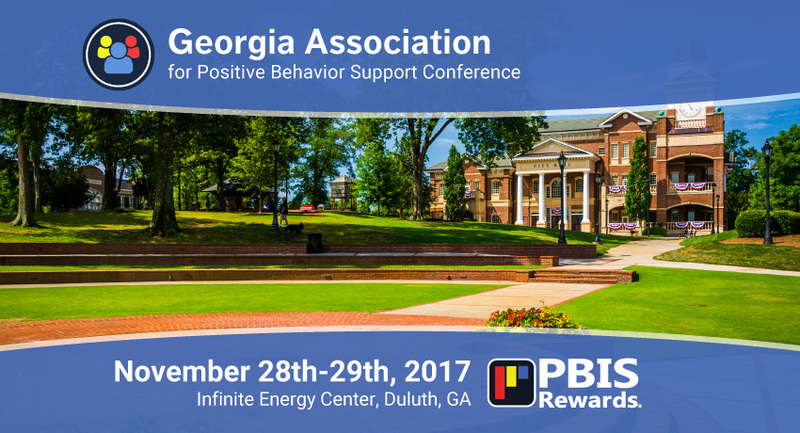 Now in its tenth year, the Georgia Association for Positive Behavior Support (GAPBS) conference offers a forum for educators, counselors, clinicians, and families to discuss strategies and interventions for positive behavior. This years’ conference theme is “Connecting School, Community, and Home Through Positive Behavior Support,” and will take place November 28-29, 2017, in Duluth, Georgia. Positive behavior supports are effective in a variety of settings, from schools to mental health and counseling practices. As an affiliate of the nationwide Association for Positive Behavior Supports (APBS), GAPBS works toward increasing the visibility and success of positive behavior supports in Georgia. In 2007, the Georgia Department of Education (GaDOE) began addressing the relationship between behavior and suspensions among students with disabilities. With the assistance and guidance of the National Technical Assistance Center for PBIS, the GaDOE established a PBIS network in Georgia. School districts throughout Georgia receive training and assistance from the GaDOE’s state PBIS team to implement PBIS in their schools. Dr. George Sugai will be the keynote speaker at the 2017 conference. Dr. Sugai is a leading researcher in the study and development of positive behavioral interventions. His assistance to the GaDOE in development of a statewide PBIS framework has been invaluable. Other speakers on the conference agenda will address the many facets of PBIS as they apply in school settings. These speakers include individuals working at local, state, and national levels to promote PBIS for all schools. A list of speakers can be found here. As an exhibitor and gold-level sponsor, PBIS Rewards is excited to speak with conference attendees and provide demonstrations of our software. We know that PBIS works – improving behavior, reducing suspensions, and increasing instructional time. PBIS Rewards can make your PBIS framework operate more efficiently! The GAPBS Conference takes place at the Infinite Energy Center in Duluth, Georgia, November 28-29, 2017. Register for the conference here.